Introduction: Endodontic emergencies are about one-third of the total dental emergency cases. Treatment modalities of endodontic emergencies have shown a great controversy. Therefore, for dentists it is vital to have enough knowledge and information about the suitable treatment protocols to manage these situations properly. The primary goal of this study aimed to determine the knowledge of dental interns regarding the management of endodontic emergencies. Materials and Methods: This cross-sectional survey compromised of 20 closed-ended questions that was distributed among dental interns in three Dental schools; King Abdul-Aziz University, Ibn Sina National College, Batterjee Medical College; in academic year 2017–2018. Questionnaire divided into two parts. The first part assessed dental interns' background and training experience. The second part assessed their knowledge toward managing different endodontic emergencies which composed of 12 conditions of pulp/periapical emergencies, and thirteen modalities of treatment. Results: About 24.7% of dental interns answered correctly all endodontic emergency conditions according to the standard protocols. The correlation test showed that significant correlation between the correct answers and students who had high score of 6th year accumulative grade, 6th year endodontic grade, students who attended meeting or conferences related to endodontic emergency, and those who had exposed to any endodontic emergency during their clinical training (P > 0.001). Moreover, there is a significant difference between the knowledge of the three dental schools. King Abdul-Aziz University showed the higher percentage to answer correctly (39.6%) compared to 11.9% Ibn Sina National College and 15.4% Batterjee Medical College. Conclusions: This study showed that dental interns' knowledge and awareness were almost similar to previous studies except in few aspects. This emphasizes the importance of refreshing courses for dental interns to improve their competency in managing different endodontic emergencies. Endodontic emergencies define as pain and/or swelling caused by infection or inflammation to the pulpal or periapical area. They are about one-third of the total dental emergency cases. These emergencies can occur before, during, or even after the initiation or completion of the root canal therapy. Treatment of those emergencies is one of the most challenging aspects of clinical dentistry. It requires eliminating the patient's signs/symptoms and postponing the permanent treatment., Various strategies are chosen to opposite these conditions including pulpotomy, pulpectomy with intracanal medicament, and prescription of systematic medications. The systemic antibiotic has been received considerable attention for relieving infection related to endodontic emergencies. It is used as an adjunctive therapy in the management of orofacial infection, whenever indicated. However, it may be associated with unfavorable side effects. Treatment modalities of endodontic emergencies have shown a great controversy. Therefore, for dentists, it is vital to have enough knowledge and information about the suitable treatment protocols to manage these situations properly. However, as far as we know, the data regarding the knowledge of managing endodontic emergencies among dental interns is lacking. Moreover, educators are interested in changing curriculum planning based on the needs of the target audience to achieve learning goal and to bring about efficient physicians, which consider a fundamental step in ensuring the relevance of educational activities to a target audience. The primary goal of this study aimed to determine the knowledge of dental interns regarding the management of endodontic emergencies. This is cross-sectional descriptive study. A questionnaire similar to those used in Dorn's study was applied and updated. The questionnaires were distributed among dental interns in King Abdul-Aziz University, Ibn Sina National College, Batterjee Medical College – Dental schools. All dental interns enrolled during 2017–2018 academic year were eligible to participate (n = 252). The study was approved from Research Ethics Committee of the College of Dentistry, King Abdul-Aziz University reference number (082-10-17). Information was obtained by a questionnaire given to dental interns in all schools. Respondents were not asked about any identification on the forms to enable guarantee anonymity. The questionnaire compromised of 20 closed-ended questions divided into two parts. The first part screened their background and training experience including gender, 6th year accumulative grade, 6th year endodontic grade, and attending conference or meeting related to endodontic emergencies. The second part assessed the knowledge of those dental interns about endodontic emergencies. 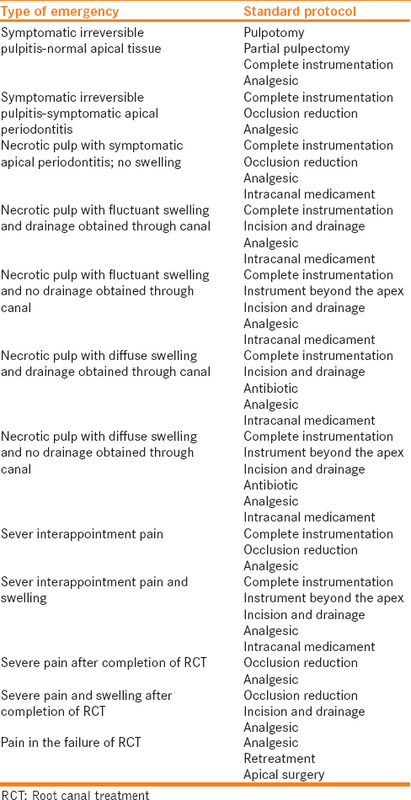 This part contained 12 various conditions of pulp/periapical emergencies [Table 1], and thirteen modalities of treatment including; pulpotomy, partial pulpectomy, complete instrumentation, retreatment, apical surgery, instrument beyond the apex, occlusion reduction, leave tooth open, trephination, incision and drainage, use of antibiotic, analgesic and intracanal medicament. 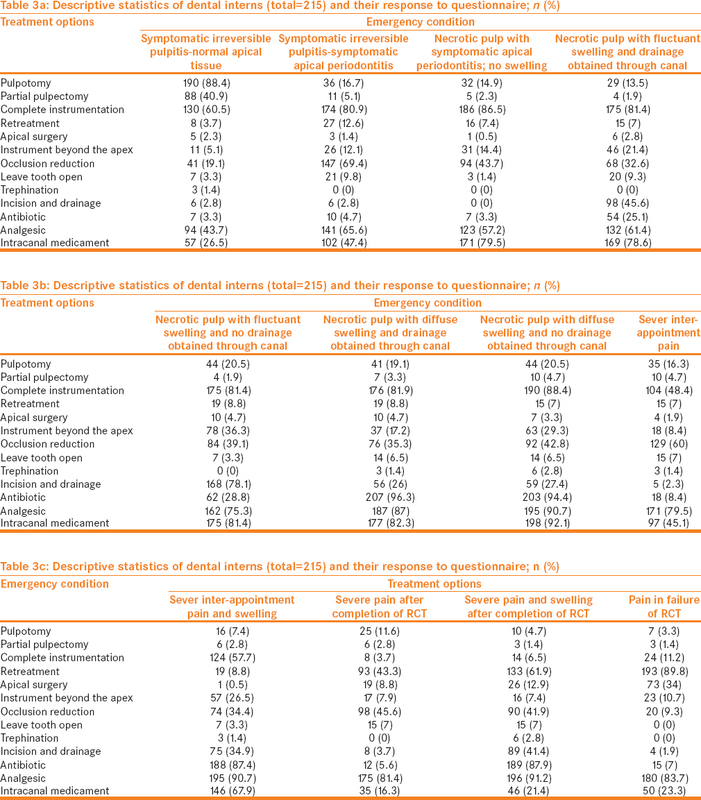 List of endodontic emergency conditions and its standard treatment protocols were shown in [Table 2]. The participants were asked to choose the correct option(s). They were asked to check all area of a questionnaire that applied to each endodontic emergency condition; so it is possible to have multiple responses for each question. The participants were given an explanation regarding the aim and benefit of conducting this survey and also they were assured of the confidentiality of their personal information. Data were collected and statistical analysis was obtained. Descriptive statistics including mean, standard deviation, and percentages were computed to describe the quantitative and categorical variables. Spearman correlation analysis was employed to assess the correlation between participants' correct answer, background, and other parameters. To determine the relationship between qualitative variables, the Chi-square analysis was used. The significance level is set at 0.01. Descriptive and correlation analyses were generated using IBM SPSS Statistics 20. (Armonk, NY, United state). In this study, 215 questionnaires were completed and returned to the author (86%) from all dental schools; 83% from King Abdul-Aziz University; 82% from Ibn Sina National College; 93% from Batterjee Medical College. The result showed that 24.7% of dental interns answered correctly all endodontic emergency conditions according to the standard protocols. The correlation test [Table 4] showed that significant correlation between correct answers and dental schools (P > 0.001), students who had high score of 6th year accumulative grade (P > 0.001), 6th year endodontic grade (P > 0.001), students who attended meeting or conferences related to endodontic emergency (P > 0.001), and those who had exposed to any endodontic emergency during their clinical training (P > 0.001). However, no correlation between correct answers and gender, their confident in diagnosing or treating emergency conditions, and their interest in continuing postgraduate in endodontic. The aim of this study was to compare the level of knowledge of dental interns in three dental schools in Jeddah, Saudi Arabia, in the academic year 2017–2018 in regard to their knowledge and attitude toward managing endodontic emergencies based on a standard protocol followed. Although there is a notable controversy about various treatment modalities of endodontic emergencies, little research is available in this issue. Since there are some differences between treatment plans about endodontic emergencies in different textbooks, determining just one standard treatment procedure is not easy. Standard treatment plans in this study were selected based on the main endodontic textbooks, since these two books have been used as reference books in their undergraduate training. About 16.7% of dental interns chose pulpotomy in case of symptomatic irreversible pulpitis with symptomatic apical periodontitis. About 80.9% of the respondents seemed to choose complete instrumentation. In the standard protocol, occlusal reduction is introduced as a standard treatment option, which was selected by 68.4% of the dental interns significantly more than what it was suspected. This treatment protocol was advocated by previous studies as well as several surveys of board-certified endodontists.,,,, They suggested initiating root canal treatment, with complete pulp removal and total cleaning of the root canal system in case of symptomatic irreversible pulpitis. They also advised for occlusal reduction since it eliminates postoperative pain in patients with symptomatic irreversible pulpitis, percussion sensitivity, preoperative pain, and/or the absence of periradicular radiolucency. In the study by Dorn et al., 80% of the endodontist suggested occlusal reduction when there was irreversible pulpitis accompanied by symptomatic apical periodontitis. In another study by Bidar et al., 62.5% of the endodontist and 25.8% of the general dentist recommended occlusal reduction in cases of irreversible pulpitis accompanied by apical periodontitis. In necrotic teeth without swelling, the most common and standard emergency treatment includes complete instrumentation, occlusal reduction, prescription of analgesics, and application of intracanal medicament., Treatment preference of dental interns in this condition was in accordance with this standard treatment; 86.5% complete instrumentation, 43.7% occlusal reduction, 57.2% prescription of analgesics, and 79.5% application of intracanal medicament. The treatment in this condition is similar to those of vital pulp; however, respondents favored complete instrumentation more compared to pulpotomy. In the study by Dorn et al., 57.6% of the endodontist suggested complete instrumentation and 29.4% analgesic. In another study by Bidar et al., 100% of the endodontist and 66.6% of the general dentist recommended complete instrumentation, 75% of the endodontist and 21.6% of the general dentist recommended analgesic. Our result is similar to the endodontists' answers in Bidar et al. The standard emergency treatment of teeth with necrotic pulp, fluctuant swelling, and drainage through the canal includes complete instrumentation.,, About 81.4% of the dental interns chose this protocol, 45.6% incision and drainage, 61.4% analgesic, and 78.6% intracanal medicament. Our study is consistent with Bidar et al. where 83.3% of the endodontist recommended complete instrumentation, 34.3% incision and drainage, 75% analgesic, and 75% intracanal medicament. Several authors have advocated confining the instruments to canal limits in cases of necrotic pulp with drainage through the canal to minimize pushing the necrotic debris into the periapical region and thus exacerbate an already exist acute situation. However, filing beyond the radiographic apex was recommended by Torabinejad and Keiser when no drainage can be obtained through the canal. Moreover, 9.4% of dental interns preferred to “Leave tooth open” when there is pulpal necrosis and swelling. The opened canal is a suitable place for aggregation of bacteria, food debris, and viruses. This treatment modality is not considered as a standard option., Selden and Parris observed that leaving tooth open would result in 11% more secondary periapical involvement. It is recommended to leave the teeth open with active drainage, i.e., rubber dam for a short time before sealing them to prevent later flare-up. Weine et al. found that contemporary restoration of teeth in the emergency visit would result in less exacerbation and fewer treatment visits. Another standard treatment option in this endodontic emergency includes incision and drainage, which was selected by 45.6% of dental interns. Sometimes more than one abscess is possible. One is connected to apex, and the other one is separately in the vestibule. Since they are not connected with each other, drainage through the tooth is not enough and incision is also necessary. Therefore, the respondents should choose incision and drainage option as a classic answer; even in cases when swelling is not considerable, it is better to do incision to reduce pain and swelling. Filing beyond the radiographic apex ranges from periapical stimulation with medium sized file, to a short distance out of the apex into the periapical area to over-instrument the apical foramen. This approach was proposed by Bhaskar who suggested that 1 mm over instrumentation beyond the apical foramen may help in draining inflammatory exudate and elicit an inflammatory reaction that enhance healing of periradicular tissue. Care should be considered although this approach will not cause any damage to the surrounding vital structure as long as minimal over instrumentation was ensured. It is important to remind that there is no need to prescribe antibiotic in this emergency condition; however, the results of our study showed that nearly 28.8% of dental interns did not follow the correct protocol for antibiotic prescription. Similar findings were reported by Al-Maslamani et al. In necrotic teeth, diffused swelling without drainage through canal, 81.9% and 82.3% of the respondents preferred complete instrumentation with intracanal medicament respectively which is in accordance with the standard treatment plan. One of the other standard treatment options in these cases is incision and drainage that was chosen by 26% of dental interns. If there is fluctuant swelling, this number rises up to 78%. This difference can be due to the worldwide agreement about incising the fluctuant swelling to obtain drainage. However, there is still controversy regarding incision of diffused swellings. It is necessary to prescribe antibiotics in cases with diffuse swelling. In this study, 96.3% of dental interns recommended antibiotics. Nabavizadeh et al. reported that only 29% of dentists had adequate knowledge about the correct protocol for antibiotic prescription. Kakoei et al. showed that high percentage of responders prescribe antibiotic for fever and diffused swelling. However, some situations such as pulpitis, periapical lesions, and marginal gingivitis were irrationally prescribed. Our study is consistent with Bidar et al. where 87.5% of the endodontist recommend complete canal instrumentation, 50% incisions and drainage, 65.6% placement of intracanal medicament, 75% analgesic prescription, and 90.6% antibiotics prescription. In necrotic teeth, diffused swelling with drainage through canal, 88.4% of the respondents preferred complete instrumentation with 92.1% intracanal medicament, 90.7% analgesic prescription, 94.4% antibiotic prescription which is in accordance with the standard treatment plan. It is necessary to prescribe antibiotics in cases of diffuse swelling even if there is drainage through the canal. This is because sometimes more than one abscess is possible, and drainage through the canal may not overcome the bacterial load in the diffuse swelling. Moreover, 27.4% of the dental interns agreed to do incision and drainage. This percentage is not consistent with Bidar et al. where 62.5% of the endodontist agreed to do incision and drainage. This could be due to the fearful of dental interns to incise through diffuse swelling. In cases of severe interappointment pain, standard treatment included re-instrumentation, occlusal reduction and analgesic prescription., 48.4% of the dental interns recommended re-instrumentation in this condition compared to Bidar et al. where 75% of the endodontist recommend complete instrumentation. This difference could be due to the lack of knowledge to our dental interns about the need of re-instrumentation in case of flare up. In addition, 60% of the respondents recommended occlusal reduction. Analgesic prescription was recommended by most of the respondents 79.5%, which was consistent with the standard treatment. Usually, when there is interappointment pain, the temporary filling should be checked for traumatic occlusal contacts. In cases of interappointment flare-ups with severe pain and swelling, the standard treatment protocol includes re-instrumentation, filing beyond the apex, incision and drainage, analgesic prescription and placement of intracranial medicament., More than 57% of the dental interns chose re-instrumentation in these cases. Swelling that present between appointments, could be managed by incision and drainage. In the present study, only 34.9% of dental interns recommended incision and drainage. Although filing beyond the apex is one of the standard protocols in this condition, only 26.5% of the dental interns chose that option. In case of pain after randomized controlled trial (RCT), the recommended protocol is analgesic prescription and occlusal reduction and follows up. This protocol was in agreement with the dental interns in 81.4% and 45.6%, respectively. 43.3% of the dental interns reported immediate nonsurgical retreatment. Our study is consistent with the previous study be Bidar et al. who recommend 100% analgesic prescription and 53% occlusal reduction. In cases with severe pain and swelling after RCT, 41.4% of the dental interns chose incision and drainage, 41.9% occlusal reduction. It should be mentioned that 61.9% of the dental interns decided to go for retreatment which is against the standard protocol as the primary treatment of pain and swelling immediately after RCT. It should be noted that pain after RCT is not considered as a failure of treatment and is regarded as postoperative flare-up. This study is not consistent with the previous study be Bidar et al. who recommend 96.8% analgesic prescription and 59.6% occlusal reduction. Retreatment is required in cases with unsuccessful previous RCT. When there is an acute apical abscess with an unsuitable RCT and no coronal access, retreatment or apical surgery is required.,,, Although retreatment was recommended by 89.8% of all respondents, only 34% recommended apical surgery. Our study is not consistent with the previous study by Bidar et al. who recommend 100% of apical surgery in failed root canal treatment. This big difference may be due to the lack of knowledge to our dental interns about apical surgery and its indications. Another significant finding in this study was the used of calcium hydroxide as an intracanal medicament which was significantly higher in all different conditions. The role of intracanal medication in vital pulp tissue is doubtful. However, in infected root canals, intracanal medication has been advocated for many purposes: Root canal disinfection, reduce inflammation of periapical tissues, and neutralize tissue debris. Thus, the dental intern should be more aware on the indication of the use of intracanal medicament and not routinely place it especially in root canal treatment of teeth containing vital pulp tissue. The majority of the respondents would prescribe analgesic in all emergency conditions. They may prescribe anything range from nonnarcotic medication in case of mild-to-moderate pain to narcotic medication in severe pain. It is important to note that there was a highly significant difference between the knowledge of the three dental schools [Table 5]. King Abdul-Aziz University showed the higher percentage to answer correctly (39.6%) compared to 11.9% Ibn Sina National College and 15.4% Batterjee Medical College. This difference could be due to the curriculum followed in King Abdul-Aziz University, the number of teeth required to complete before graduation, and faculty:student ratio. This study showed that dental interns' knowledge and awareness to the standard endodontic emergency treatment protocol were almost similar to previous studies except in few aspect: The level of knowledge of dental interns about the indications of incision and drainage in case of diffuse swelling, instrumentation beyond the apex is required in some cases of swelling with no drainage through the canal to stimulate drainage, instrumentation in cases of pain and swelling between the appointments, and consider apical surgery as a retreatment option. This emphasizes the importance of refreshing courses for dental interns to improve their competency in the management of endodontic emergencies. In addition to the use of a variety of educational methods such as problem-based learning lectures and powering the curriculum concerning those topics of endodontic emergencies. One limitation of this study was the cross-sectional design. Furthermore, the anterior and posterior teeth were not separately evaluated. The majority of dental interns in this study are at higher level of knowledge in managing different endodontic emergencies. Academic institutions should place a greater effort to stress more on some aspect such as incision and drainage, apical surgery which will improve the success of graduate dental work. The author would like to thanks the dental interns' offices in King Abdul-Aziz University, Ibn Sina National College, Batterjee Medical College for their cooperation in distributing the questionnaire and follow-up. Dorn SO, Moodnik RM, Feldman MJ, Borden BG. Treatment of the endodontic emergency: A report based on a questionnaire – Part I. J Endod 1977;3:94-100. Shqair AQ, Gomes GB, Oliveira A, Goettems ML, Romano AR, Schardozim LR, et al. Dental emergencies in a university pediatric dentistry clinic: A retrospective study. Braz Oral Res 2012;26:50-6. Gatewood RS, Himel VT, Dorn SO. Treatment of the endodontic emergency: A decade later. J Endod 1990;16:284-91. Cohen SH. Pathways of the Pulp. 10th ed. St. Louis: Mosby; 2011. Raoof M, Vakilian A, Kakoei S, Manochehrifar H, Mohammadalizadeh S. Should medical students be educated about dental trauma emergency management? A study of physicians and dentists in Kerman province, Iran. J Dent Educ 2013;77:494-501. Nagle D, Reader A, Beck M, Weaver J. 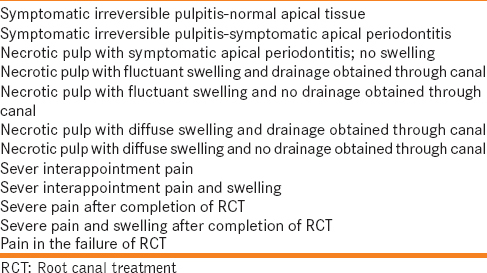 Effect of systemic penicillin on pain in untreated irreversible pulpitis. Oral Surg Oral Med Oral Pathol Oral Radiol Endod 2000;90:636-40. Halawany HS, Al-Jazairy YH, Al-Maflehi N, Abraham NB, Jacob V. Application of the european-modified dental clinical learning environment inventory (DECLEI) in dental schools in Riyadh, Saudi Arabia. Eur J Dent Educ 2017;21:e50-8. Torabinejad MW, Keiser K. Endodontics: Principles and Practice. 4th ed. St. Louis: Mosby; 2008. Natkin E. Treatment of endodontic emergencies. Dent Clin North Am 1974;18:243-55. Lynch CD, Burke FM, Ní Ríordáin R, Hannigan A. Endodontic treatment completion following emergency pulpectomy. Community Dent Health 2010;27:114-7. Hasselgren G. Pains of dental origin. Dent Clin North Am 2000;12:263. Lee M, Winkler J, Hartwell G, Stewart J, Caine R. Current trends in endodontic practice: Emergency treatments and technological armamentarium. J Endod 2009;35:35-9. Bidar M, Gharechahi M, Soleimani T, Eslami N. A survey over the dentists' and endodntists' approaches towards the management of endodontic emergencies in Mashhad, Iran. Iran Endod J 2015;10:256-62. Matthews DC, Sutherland S, Basrani B. Emergency management of acute apical abscesses in the permanent dentition: A systematic review of the literature. J Can Dent Assoc 2003;69:660. Nabavizadeh MR, Sahebi S, Nadian I. Antibiotic prescription for endodontic treatment: General dentist knowledge + practice in shiraz. Iran Endod J 2011;6:54-9. Selden HS, Parris L. Management of endodontic emergencies. ASDC J Dent Child 1970;37:260-7. Weine FS, Healey HJ, Theiss EP. Endodontic emergency dilemma: Leave tooth open or keep it closed? Oral Surg Oral Med Oral Pathol 1975;40:531-6. Auslander WP. The acute apical abscess. N Y State Dent J 1970;36:623-30. Bhaskar SN. Nonsurgical resolution of radicular cysts. Oral Surg Oral Med Oral Pathol 1972;34:458-68. Weine FS. Endodontic Therapy. St. Louis: C. V. Mosby Co.; 1972. Esposito JV. Apical violation in periapical “area” cases. Blasphemy or therapy? Dent Clin North Am 1990;34:171-8. Al-Maslamani MJ, Sedeqi FA, Moule AJ. Prescription pattern of antibiotic and analgesic in endodontic treatment in Kuwaiti population: A self-administered survey. Saudi Endod J 2014;4:128-34. Kakoei S, Raoof M, Baghaei F, Adhami S. Pattern of antibiotic prescription among dentists in Iran. Iran Endod J 2007;2:19-23. Luebke RG. Surgical endodontics. Dent Clin North Am 1974;18:379-91. Chestner SB, Selman AJ, Friedman J, Heyman RA. Apical fenestration: Solution to recalcitrant pain in root canal therapy. J Am Dent Assoc 1968;77:846-8. Wolfsohn BL. Surgical fistulation. In: Ingle JL, editor. Endodontics. Philadelphia: Lea and Febiger; 1965. p. 519. Morse DM. Clinical Endodontology. Springfield, Ill: Charles C Thomas; 1974. Siskin M. Surgical techniques applicable to endodontics. Dent Clin North Am 1967;11:745-69. Penesis VA, Fitzgerald PI, Fayad MI, Wenckus CS, BeGole EA, Johnson BR, et al. Outcome of one-visit and two-visit endodontic treatment of necrotic teeth with apical periodontitis: A randomized controlled trial with one-year evaluation. J Endod 2008;34:251-7. Song M, Chung W, Lee SJ, Kim E. Long-term outcome of the cases classified as successes based on short-term follow-up in endodontic microsurgery. J Endod 2012;38:1192-6. Song M, Shin SJ, Kim E. Outcomes of endodontic micro-resurgery: A prospective clinical study. J Endod 2011;37:316-20.